Bold, colourful design. Bright and airy, even on this wet day. I’ve had a great mail from Matthew Fraser, Acting Senior Care Officer at the St. James Resource Centre, Brownhills. Matthew wanted to alert readers of the Brownhills Blog that the new extra care facility, Knaves Court will be holding a public open day on Thursday, 9th September at 10:00am. Just to let you know that the new Housing21 development is having a public open day on 9th September from 10am. I really enjoy your blog! I’m a care worker at St. James Resource Centre, Knaves Court will be replacing St. James. If you would like to come along and have a look around, that would be lovely. 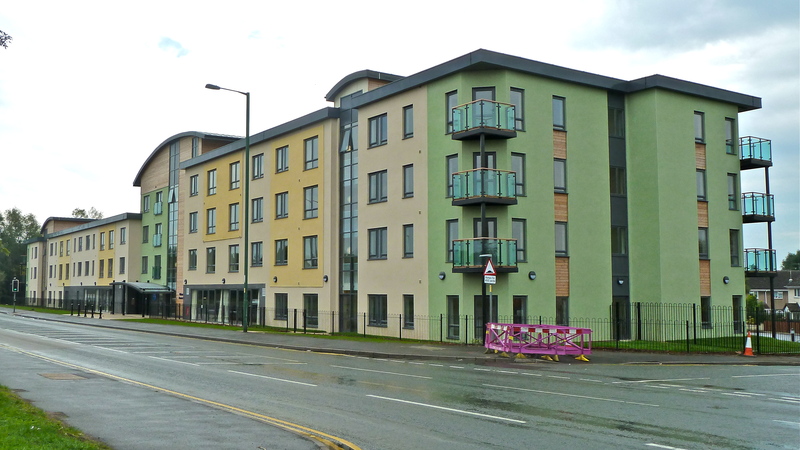 Knaves Court, as most locals will know, has been built on the site previously occupied by Waine House, adjacent to Anchor Bridge, and has been 18 months in the building. The facility is looking excellent, and it’s really good to see some care and thought going into social projects for the elderly. In the support of a rapidly growing demographic, projects like this will become more and more important. On that note, I’m a little concerned that this means the closure of the St. James Centre; built in the 1970’s, it is a well loved complex. I asked Matthew about the fate of the residents currently housed there and of the ultimate fate of the centre in Short Street. In answer to your questions, all St. James residents will be moving to Knaves Court in the next few weeks. As for St. James itself, Walsall Housing Group and Housing21/Walsall Council did a land swap so now WHG own the land St James sits on, I would imagine St James will most likely be knocked down to accommodate new housing developments. I’ve been up today for the very first time, and i have to say it is absolutely stunning. The capacity for good quality elderly care has doubled. However St James is a residential scheme, whereas Knaves is extra care, kind of like home care but under one roof. There is also a shop, restaurant and salon, all can be accessed by the general public too, we are hoping that Knaves will be a community facility as well as a fantastic replacement for St James. I welcome Knaves Court and the revolutionary thinking it brings to care for the elderly, vulnerable and infirm. It’s a modern, well designed facility that looks to be excellent. I’m a little concerned, however, about the fate of St. James; Walsall Housing Group and their partners, Walsall Council already own huge tracts of derelict, empty land in Brownhills created by the demolition of grim, unpleasant social housing – sites at Deakin Avenue, Silver Court Gardens, the former Bailey House, Wessex Close and at High Street, opposite Knaves Court. With the provision of social care at breaking point, it seems a bit perverse to be closing a relatively modern residential unit. One would hope St. James won’t befall the same fate as comparitive facilities in Staffordshire, like Greenwood House in Burntwood, now empty and decaying, only a few decades old, whilst service users wait for placements in the remaining overstretched facilities. I wish Matthew and his team all the very best in their new project and look forward to seeing the development for myself. It’s good to see that Brownhills is at the forefront of modern care for a change, and the people of Brownhills deserve the very best – so why not pop in and check out the centre for yourself on Thursday? The St. James centre faces an uncertain future - let's hope the site doesn't sit vacant like so many others. This entry was posted in Brownhills stuff, Events, Followups, Fun stuff to see and do, Interesting photos, Local politics, planning, Reader enquiries, Shared media, Walsall Council and tagged Anchor Bridge, Brownhills, Care provision, elderly care, extra care, Housing21, Knaves Court, Local politics, Matthew Fraser, New Photos, planning, Politics, Redevelopment, Short Street, Social Care, Social Services, St James Home, Staffordshire, Walsall, Walsall Council, Walsall Housing Group, Walsall politics, WHG. Bookmark the permalink.